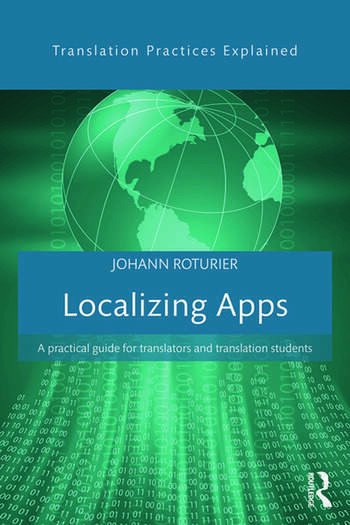 This is the Companion Site of Johann Roturier's Localizing Apps book, which book was published in May 2015 by Routledge, so it can be ordered here. This site includes a number of materials presented and referenced in the book. It is the author's hope that these links will save you a lot of unnecessary typing. If you notice any problem with the content (either from the book or in these materials), feel free to report them to the author. Each chapter from the book is summarized on this page. An excerpt from the book (including the table of contents and a few pages from the Introduction) has also been made available by the publisher. This page contain most of the code snippets and task files used in this book (including the link to access a tutorial on regular expressions that was specifically created for this book). This page contains all the links listed in the Notes section at the end of each chapter. The book has been reviewed in various journals and also used in courses. If you find errors in the book or site content, feel free to report them by email: info [at] localizingapps__dot__com (adjust the address as required). Documentation built with MkDocs using a theme from the Mkdocs Bootswatch project.